An oil painting class for people who have never painted using oils before but want to create a beautiful painting. No drawing skills required. You must be 13 or older for this class. You will create your very own oil painting on a canvas that will be provided. 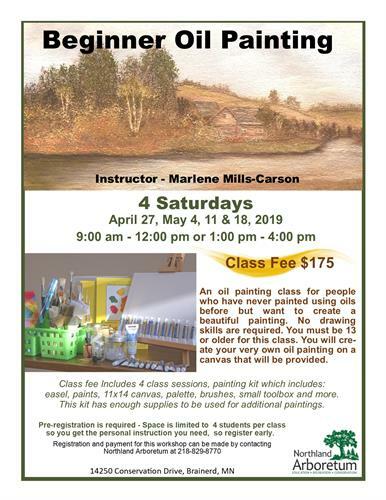 Class fee includes 4 class sessions, paint kit which includes: easel, paints, 11x14 canvas, palette, brushes, small toolbox, and more supplies to be used for additional paintings.